Remember back in the late 80’s/early 90’s? I know, I don’t really like to think about that time period either but bear with me. Do your memories of that era smell like cucumber melon? Well, mine do. As I recall, it was the trendy scent of the moment for much too long and in my circle of girlfriends if you didn’t positively reek of cucumber melon at all times you just weren’t cool. We’d all drag our mothers to Bath and Body Works to purchase the holy trinity of bath products – shower gel, body lotion, and body spray. Because even after washing yourself with cucumber melon body wash and moisturizing with the lotion, by third period your classmates sitting a few rows behind you probably couldn’t smell you anymore so it was imperative that we refresh with the body spray. Fortunately, I think teenage girls have stopped drenching themselves in body sprays every hour on the hour, but sadly the trend seems to have been taken up by teenage boys and twenty-something men instead, albeit with slightly more masculine scents. By high school, cucumber melon had thankfully fallen out of favor and the scent kind of repulsed me for awhile. Luckily after a dozen or so years away from a cucumber melon saturated world I have recovered and realized that the combination was popular for so long for good reason. It’s really a lovely produce marriage where each part brings out the best in the other. The heady sweetness of the melon can be a touch overwhelming on its own, while the fresh, clean cucumber can be, to be honest, a little boring at times. But together? A perfect pairing. While I’m certainly not about to go out and buy myself another bottle of body spray, I do enjoy the flavor combo in a cocktail every now and again. 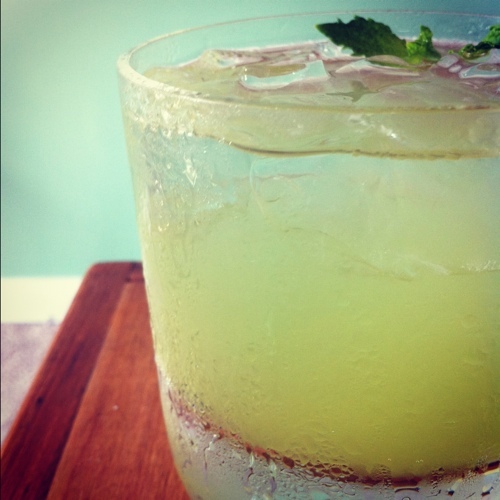 I came up with this tipple a few weeks ago when I brought home the most perfectly ripe and delicious honeydew melon that I have ever tasted. We’re talking a melon so juicy that the little melon balls were practically floating in the juices they generated after sitting in the fridge for a few hours. Not being one to waste food (or drink), I simply had to come up with something to do with all of that juice. Cucumber melon came to mind, and with the thought of cucumber came Hendrick’s gin. If you haven’t tried Hendrick’s, please do so immediately. Try it even if you don’t like gin. It’s not all pine needles and alcohol burn like you get with some gins (which I do enjoy, to be fair). It tastes of rose and cucumber and is so very smooth it could easily get you into serious trouble. And combined with that sweet, summery honeydew juice it makes a refreshing adult beverage that brings me right back to my youthful misadventures. This is a cocktail, like most with a base of fresh fruit, that will require some tweaking each time you make it depending on the ripeness of the melon. If you are lucky enough to stumble upon a melon like the one that inspired this recipe, you’ll only need to ball or cube the melon and let it sit in a bowl in the fridge for a few hours and you will be rewarded with copious amounts of juice. Plus, you’ll still have the fruit to eat! If you’re not quite so fortunate, you’ll have to do a little work to get the juice, but I promise it’s worth it. Also, I recommend using agave nectar as the sweetener here because it incorporates very well into cold beverages and you won’t find yourself forcing down a sickly sweet last sip because all of the sweetener fell to the bottom of the glass. If agave isn’t really your thing, feel free to substitue the sweetener of your choice. Fill a rocks glass with ice cubes. Pour gin and melon juice over ice and stir. Take a tiny sip and taste. If it isn’t quite sweet enough for you, add a little agave nectar to taste and stir well. 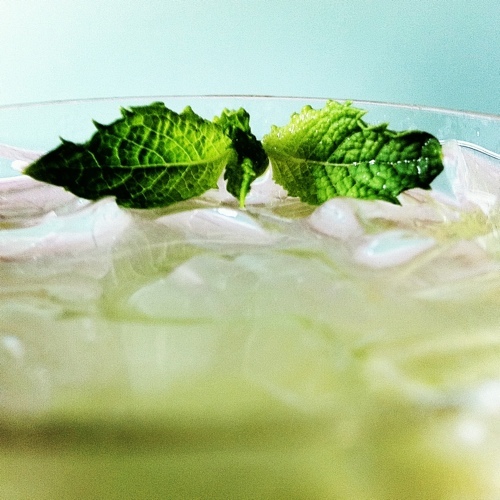 Top off the glass with club soda, stir, and garnish with a sprig of mint. Ball or cube half of a small honeydew melon and puree the pieces in a blender. Strain the puree through a fine mesh sieve into a bowl or measuring cup. Any leftover juice can be refrigerated for a few days. *This will make more juice than you’ll need for the spritzer. Exactly how much more will depend on your melon. **The leftover melon pulp is a tasty dog snack. Or so my pup tells me.